Review of Island Songs, by Janet Sturman in the April 2013 issue of Journal of Historical Research in Music Education. Stefanie Stadler Elmer (University of Zurich, and Teacher Education University in Swizerland) AIRS Theme 1, will receive an Honorary Doctorat from the Latvian University Daugavpils. Laurel Trainer (McMaster University) Theme 1, has been inducted in 2015 into the Royal Society of Canada - Canada's most esteemed scholarly organization. Developmental research in music has typically centered on the study of single musical skills (e.g., singing, listening) and has been conducted with middle class children who learn music in schools and conservatories. Information on the musical development of children from different social strata, who are enrolled in community-based music programs, remains elusive. This study examined the development of musical skills in underprivileged children who were attending an El Sistema-inspired program in Los Angeles. We investigated how children, predominantly of Latino ethnicity, developed musically with respect to the following musical skills – pitch and rhythmic discrimination, pitch matching, singing a song from memory, and rhythmic entrainment – over the course of 1 year. Results suggested that participation in an El Sistema-inspired program affects children’s musical development in distinct ways; with pitch perception and production skills developing faster than rhythmic skills. Furthermore, children from the same ethnic and social background, who did not participate in the El Sistema-inspired music program, showed a decline in singing and pitch discrimination skills over the course of 1 year. Taken together, these results are consistent with the idea of musical development as a complex, spiraling and recursive process that is influenced by several factors including type of musical training. Implications for future research are outlined. Read more about March 2016 - News! Performing music in public is widely recognized as a potentially stress-inducing activity. However, despite the interest in music performance as an acute psychosocial stressor, there has been relatively little research on the effects of public performance on the endocrine system. This study examined the impact of singing in a low-stress performance situation and a high-stress live concert on levels of glucocorticoids (cortisol and cortisone) in 15 professional singers. The results showed a significant decrease in both cortisol and cortisone across the low-stress condition, suggesting that singing in itself is a stress-reducing (and possibly health-promoting) activity, but significant increases across the high-stress condition. This is the first study to demonstrate that singing affects cortisol as well as cortisone responses and that these responses are modulated by the conditions of performance. Read more about February 2016 - News! The thesis consists of four research articles, one of which is a case study observation of vocal development from birth to 25 months, and the others are based on data acquired from the AIRS Test Battery of Singing Skills (ATBSS) from two waves of data, one of 26 Estonian children ages 4-12 years and another of 43 Estonian children age 2 to 8 years. 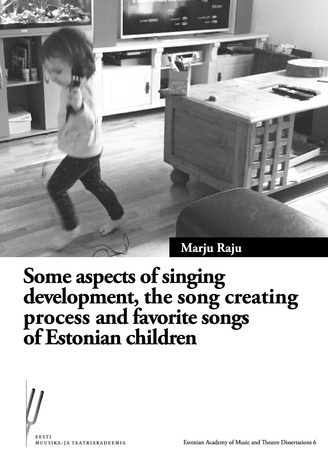 Together the studies reveal an inter-relation between language and singing development, a relative weighting on verbal over musical challenges in children's songmaking, the early acquisition of the Western tonal musical canon (as early a 2 years of age), and the reflection of the Estonian musical culture in the favorite songs of Estonian children. Congratulations Marju on your outstanding accomplishment in this pioneering work which has greatly furthered the goals of AIRS, particularly in the Developmental theme. 33rd PsyArt International Conference to be held at the Université de Reims Champagne-Ardenne, France, June 29-July 4, 2016. Read more about Januray 2016 - News!